Our genetic makeup is an important factor in lifespan determination. Lifespan is a polygenic trait, but few of the genes responsible have been discovered. FOXO3 was shown by Brad Willcox’s group in Hawaii a decade ago to be a longevity gene. Their findings were then replicated in multiple studies of long-lived populations worldwide. FOXO3 encodes the transcription factor forkhead/winged helix box gene, group O, type 3 (Foxo3). Foxo3, by binding to the promoter of various genes across the genome, regulates a wide array of processes that confer cell resilience and healthy aging. Recently, the Willcox team reported in Aging Cell that FOXO3 operates by interacting directly with 46 genes either side of its genomic location on chromosome 6q21. They found that FOXO3 is located at the hub of this early-replicating, highly conserved region. Importantly, like FOXO3, its 46 neighboring genes are also involved in various processes that contribute to cell resilience, such as autophagy, stress response, energy/nutrient sensing, cell proliferation, apoptosis and stem cell maintenance. By working together the genes, when co-expressed, make cells and their associated organs healthier with age, thus potentially increasing the probability of having a longer, healthier lifespan. The first author of the study, Tim Donlon, further discovered that the interaction of FOXO3 with its neighboring genes involved CCCTC-binding factor zinc finger protein (CTCF), a transcription factor that binds promoters, so attracting tissue-specific transcriptional activators, repressors, cohesion, and RNA polymerase II. CTCF is pivotal to chromatin architecture. It makes contact with tens of thousands of sites across the genome by using different combinations of its 11 zinc finger domains to bind different DNA target sequences and proteins. CTCF brings cis-regulatory elements together into co-regulated islands several hundred kb in size. Multiple islands are then brought together into a functional neighborhood, or “archipelago”, of 3–5 Mb. The action of CTCF causes the looping of chromatin between the CTCF binding sites on DNA. The researchers had in effect discovered what they referred to as the first “gene factory” for healthy aging and longevity. They then used fluorescent in situ hybridization (FISH) of lymphoblastoid cell lines to confirm their findings. 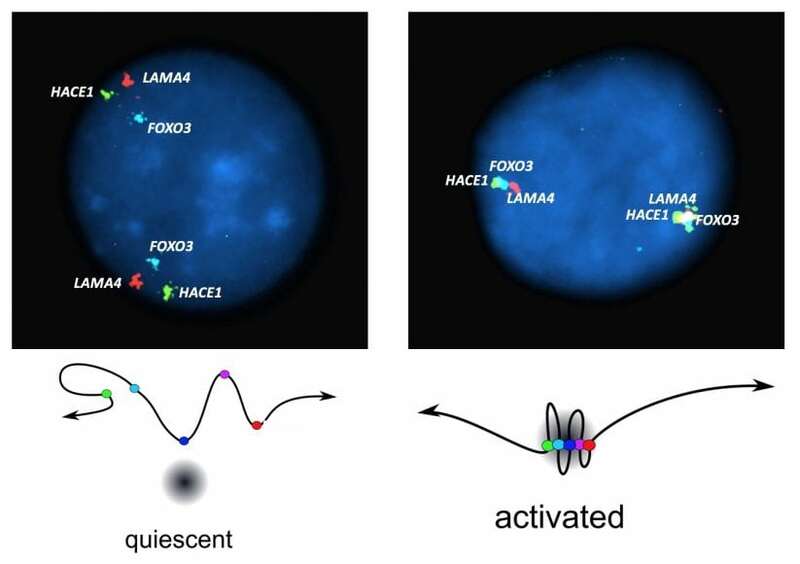 By examining nuclei in which different genes were labelled with different colored fluorescent dyes they were able to visualize the movement of FOXO3 and some of these 46 neighboring genes into close proximity with the expression machinery (i.e., the transcription apparatus) when the cell moves from a “quiescent” state to an “activated” state. The illustration above shows these findings. In a case-control genetic study of 110 single nucleotide polymorphisms (SNPs) in FOXO3 and 5 kb of its flanking DNA, they found 41 SNPs that were associated with longevity, defined as living to 95 years of age or older. The subjects for the study were American men of Japanese ancestry living on Oahu, the most populated island of Hawaii. Amongst the SNPs, they found that the nucleotide changes in 13 disrupted binding sites for 18 transcription factors. By modeling with the use of the WashU Genome Browser they found that these SNPs were connected to the FOXO3 promoter via RNA II polymerase binding and likely formed a longevity-associated haplotype or cis-regulatory unit. They confirmed that these SNPs are functional by semi-quantitative PCR of FOXO3 mRNA in genotypically different lymphoblastoid cell lines. They also showed that two of the genes, HACE1 and AMD1, which are furthest from FOXO3, are also activated by stress. But they are yet to test the response of all of the other genes. Measurements in their FISH experiments further showed that neighboring genes coalesced together around FOXO3 following stress and that the movement of the FOXO3 longevity haplotype was greater than the movement of the common haplotype in lymphoblastoid cell lines. These findings are interesting in that genotype-phenotype correlations common in the study of complex traits often focus on single protein-coding genes but ignore gene neighborhoods. Recently, Boyle and co-workers at Stanford proposed an “omnigenic” model, which suggests that complex polygenic traits are caused by minuscule contributions from a vast number of sufficiently interconnected peripheral DNA variants that affect core disease-related genes in relevant tissues. Brian Morris, the author for correspondence on the FOXO3 article, has suggested that physical interactions between genes themselves might be an additional contributory factor in the omnigenic model. Whether gene-gene interactions might help explain some of the missing heritability inherent in complex polygenic traits generally will require further research. It may be that modulation of FOXO3 activity could have an amplifier effect on genes in its neighborhood, so adding to the effects that its own gene product, FoxO3, has on expression of specific genes across the genome. The new FOXO3 findings will hopefully inspire others to try to discover additional longevity gene neighborhoods elsewhere and to see whether these also show similar kinds of gene-gene interactions. These novel findings provide considerable food for thought in unraveling the intricate mechanisms responsible for longevity and other complex polygenic conditions. This study, FOXO3 longevity interactome on chromosome 6, was recently published by Timothy A. Donlon, Brian J. Morris, Randi Chen, Bradley J. Willcox and co-workers in the journal Aging Cell (see first Reference above). Timothy Donlon currently works at the Department of Cell and Molecular Biology , University of Hawaiʻi at Mānoa. Timothy does research in Genetics, Biotechnology and Cancer Research. Their current project is '3D chromatin organization and gene expression'. Dr. Bradley J. Willcox is Professor and Director of Research at the Department of Geriatric Medicine, John A. Burns School of Medicine, University of Hawai‘i Mānoa. Dr. Willcox trained in Medicine at the University of Toronto, Internal Medicine at the Mayo Clinic, and Geriatric Medicine at Harvard Medical School. He is Physician co-Leader of the Long Term Care Hospitalist Service at The Queen's Medical Center, where he runs an inpatient service and helps mentor internal medicine trainees and other health professionals. He is also Principal Investigator of the National Institute on Aging-funded Hawaii LIFESPAN and HEALTHSPAN Studies and a Honolulu Heart Program researcher at Kuakini Medical Center. Dr. Willcox is also Co-Principal Investigator of the Okinawa Centenarian and a researcher at the Pacific Health Research and Education Institute of the VA Pacific Islands Health Care System in Honolulu. Dr. Willcox has published widely in the genetic, environmental and clinical aspects of healthy aging, is on the Editorial Board of the Journals of Gerontology, and a frequent reviewer for the Journal of the American Geriatrics Society and the Journal of the American Medical Association. He has been recognized with the Dorothy Dillon Eweson Award for Advances in Aging Research, the Henry Christian Award from the American Federation for Medical Research, and a Director's Citation from the Centers for Medicare and Medicaid Services. He is a fellow of the Gerontological Society of America and a two-time nominee for Outstanding Physician of the Year at The Queen's Medical Center. Dr. Willcox is also an author of a NY Times best-selling book on healthy aging and his work has appeared in cover articles of Time Magazine, National Geographic, and on Oprah, Good Morning America, NOVA Science, BBC, among other media. Brian Morris is involved in research in several different fields. His long-term interest has been the molecular genetics of hypertension. Most recenty this has focussed on genome-wide alterations in gene and microRNA expression in human essential hypertension and rodent models of hypertension. With Eugenie Lumbers and colleagues at University of Newcastle research focused on the expression of various components of the (pro)renin-angiotensin system and other genes in fetal and maternal tissues to determine whether these have a role in premature labour. A major current research involvement is the molecular genetics of longevity as an Honorary Consultant and Volunteer Faculty with the University of Hawaii's Department of Geriatric Medicine at Kuakini Medical Center in Honoulu. This followed a 2 month Special Studies Program there in 2012-13 and has led to multiple publications, including several as first author and author for correspondence. Brian has considerable interest and numerous publications on the molecular mechanisms of ageing, longevity and the influences of dietary factors on health. His Lab's other research has included the molecular biology of factors involved in alternative splicing of pre-mRNAs, a process that results in the generation of multiple proteins from most of the genes in the genome. Brian was the first in the world to patent the use of PCR for cervical screening (priority date Feb 1987). This test was devised to detect the cancer-causing types of human papillomavirus. In a paradigm shift in screening of women, his HPV testing strategy replace pap smears for primary screening on 1 Dec 2017, as is also happening in other countries worldwide. His cervical cancer research led him to understand that women with circumcised male partners are at lower risk of this devastating cancer. As a result, he became interested in the health and medical benefits of male circumcision (www.circinfo.net and www.circumcisionaustralia.org), a field in which he has developed a strong international reputation, with 100 of his over 400 academic publications being on this topic.